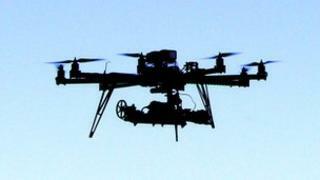 Unmanned flying drones are to be used in the hope of recovering more oil reserves by studying geology from the sky. Academics at the University of Aberdeen are using the remotely-operated machines to scan rock formations with the aim of improving understanding of subsurface reservoirs. They are in collaboration with a group at the University of Bergen in Norway. The research programme is supported by more than 20 oil firms. Prof John Howell, a geoscientist at the University of Aberdeen, said: "When you drill a well in the North Sea, you can directly measure the rocks in the borehole, however you have much less certainty about what is going on away from the well. "Given that two wells are often several miles apart, predicting what the rock layers in between the boreholes look like is a huge challenge. "To solve this problem we look at similar rock units which occur in cliffs above sea level and we use the drone to make extremely detailed 3D models, which we can then adapt for the subsurface. "This gives us a much better idea of what conditions are like between these two bore holes and then allows us to predict how the oil will follow and how much we can recover." He added: "The advantage of the drone is that it allows us to collect large volumes of data from otherwise inaccessible cliff sections in remote and often dangerous places." The work is part of a project called Safari which started in the late 1980s. "The original workers on the project have seen data collection technology come on in leaps and bounds since then but the introduction of laser scanning was one of the biggest improvements," Prof Howell said. "We're now able to create virtual rock formations that are accurate to within less than a few millimetres. "The overall project's goal is to develop a fully searchable database of these relevant rock formations which will help oil companies build better models of the subsurface and improve recovery from oil fields."